In the past few years, Indian policymakers have begun to breathe new life into the Bay of Bengal Initiative for Multi-Sectoral, Technical and Economic Cooperation (BIMSTEC). Formed in 1997, the multilateral organization consisting of seven countries across South and Southeast Asia, and focuses on 14 sectors of priority ranging from tourism to the economy to connectivity. From India’s invitation to the BIMSTEC countries to the BRICS outreach summit in Goa 2016 to initiatives such as the annual BIMSTEC Disaster Management Exercise and the first-ever military exercise of BIMSTEC countries (hosted by India), Indian interest in the sub-regional group has been on the rise. Moreover, in a speech on the occasion of 20th anniversary of BIMSTEC in 2017, Prime Minister Narendra Modi declared, “for India, [BIMSTEC] is a natural platform to fulfil our key foreign policy priorities of Neighborhood First and Act East.” Such a statement explicitly establishes the newfound importance of BIMSTEC in Indian foreign policy. The sudden surge Indian interest in this forum can be attributed to the push and pull factors in India’s foreign policy: pushing and pulling India to revitalize BIMSTEC are its security compulsions vis-à-vis Pakistan and the economic opportunities for greater connectivity with South and Southeast Asian regions. This pivot away from SAARC after the Uri attack has coincided with a careful uptick in attention towards BIMSTEC. 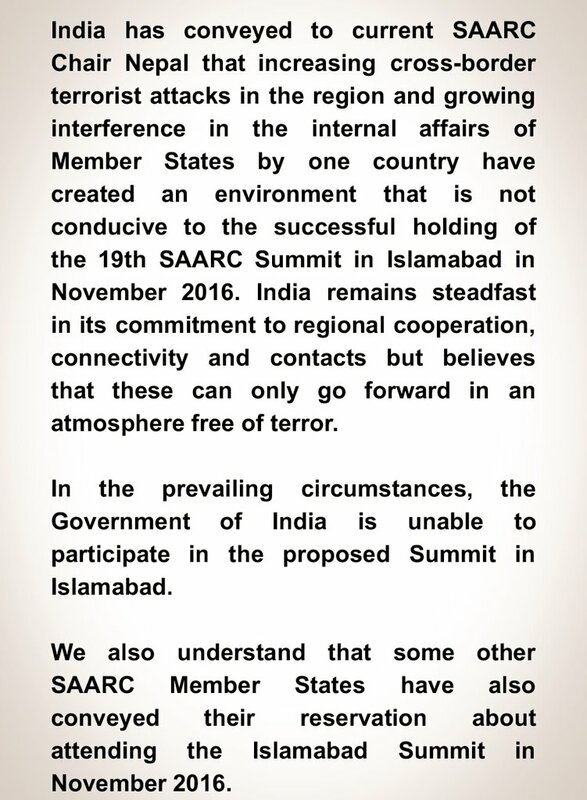 For instance, shortly after the Uri attack, India invited the member countries of BIMSTEC to the BRICS outreach summit 2016 in Goa. Since Pakistan is not a part of BIMSTEC, the timing of this invitation after the two attacks hinted at the diplomatic isolation of Pakistan from the South Asian region. The attempt to isolate Pakistan through increased attention on BIMSTEC has continued, but India has coupled this with substantive attempts to bring terrorism as a topic of importance to the regional and sub-regional stage. Most recently, at the fourth BIMSTEC Summit in August 2018 India managed to score a point against terrorism in the region, as the BIMSTEC member states decided to hold states accountable by identifying them as supporters of terrorism. According to the summit documents, the BIMSTEC countries will “[a]ffirm that the fight against terrorism should target not only terrorists, terror organizations and networks but also identify and hold accountable States and non-State entities that encourage, support or finance terrorism, provide sanctuaries to terrorists and terror groups and falsely extol their virtues.” This was one of the biggest takeaways for India from the fourth BIMSTEC summit, as India has long accused Pakistan of fomenting cross border terrorism on Indian soil. Taken together, these initiatives not only managed to isolate Pakistan in South Asia for the time being, but have also imparted new life into the BIMSTEC forum. Pulling India towards BIMSTEC are the economic opportunities of regional integration between India and the countries to its east. In BIMSTEC, India sees a valuable conduit to facilitate the seamless movement of goods, people, and services between and within South and Southeast Asia via projects in the vein of the India-Myanmar-Thailand Trilateral Highway, the Kaladan Multi-Modal Transit Transport Project (KMMTTP), and BIMSTEC Motor Vehicle Agreement (MVA). This emphasis could be seen at the inaugural session of the recent BIMSTEC Summit in Kathmandu, when Prime Minister Modi highlighted the importance of economic, trade, transport, people-to-people, and digital connectivity. It shouldn’t be forgotten that the Sittwe port in Myanmar is closer to India’s northeast region than any other port on India’s eastern coast. Thus, connecting South and Southeast Asia through BIMSTEC initiatives provides India’s northeast region with an opportunity to reduce the significant cost of logistics incurred on exports and imports. The potential for enhanced trade with BIMSTEC countries has also drawn India to the sub-regional grouping. According to a recent World Bank report, intra-regional trade accounts for only 5 percent of South Asia’s total trade, but there is potential for an increase of up to $67 billion in intra-regional trade volume from the current level of $23 billion through deeper regional trade and connectivity. However, Pakistan’s refusal to give Most Favored Nation (MFN) status to India, as well as the security reasons mentioned previously, caused the South Asia Free Trade Area (SAFTA) under SAARC to languish. On the other hand, India sees the untapped potential of BIMSTEC’s possible trade linkages: New Delhi’s total trade with the six BIMSTEC countries has grown at an annual growth rate of 10.4 percent. Despite this growth, BIMSTEC as a region only adds up to 3.7 percent of total world trade, and intra-BIMSTEC trade has grown at a meager rate of .62 percent annually. The absence of free trade agreements within the region explains the low levels of intra-regional trade, and a BIMSTEC Free Trade Area (FTA) is vital for better economic integration of this region. The fourth BIMSTEC Summit in August reiterated the need to finalize and expedite a BIMSTEC FTA, which upon implementation would cater to the needs of 21 percent of the global population living in this region. These push and pull factors are the major determinants of India’s renewed push for BIMSTEC. While the pull of economic factors has been constant since the rise of India as one of the central global economies, the recent events involving India’s western neighbor has pushed India further towards the sub-regional organization.